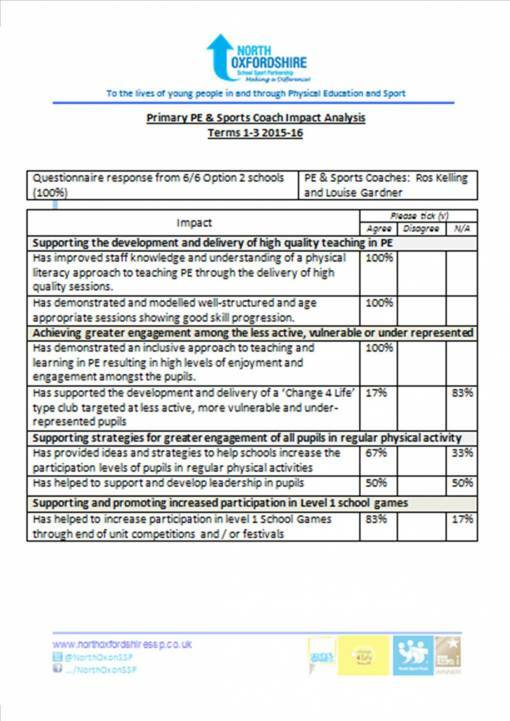 As part of our regular review process primary schools were invited to comment on the impact of our specialist PE and Sport Coaches following their deployment during terms 1-3 2015-16. 100% of Option 2 schools responded. A summary of the survey responses can be found at the bottom of this page. Sibford Gower Endowed Primary School The PE and Sports Coach deployment programme is an excellent scheme which allows the teachers involved to benefit from seeing new ideas and new ways of presenting activities to the pupils. It also gives the pupils a fresh perspective into PE activities and the knowledge that they are being taught by an expert in the area. Launton C.E. Primary School Ros has been fantastic with teaching all the children from Year 1-6 at Launton. She has helped to develop their skills using a multi-skills approach, using a range of fun, exciting activities. She has been really helpful in providing useful information and resources to support the teachers with teaching multi-skills. Christopher Rawlins Primary School Ros offered support in an interesting and supportive way. I always felt willing to ask questions and try things out if I wanted to. She gave me lots of ideas and more confidence to ‘have a go’ with multi skills and using the apparatus in different ways. Chesterton Primary School Ros Kelling was a brilliant coach. She was able to fit in to the school environment with ease. The children really enjoyed her sessions…... She has given me (as the class teacher of Year 1 and 2) more confidence in teaching gymnastics and has given me some fabulous ideas for warm ups and short games. Deddington Primary School It has been an absolute pleasure to have Louise as a sports coach. Louise has demonstrated absolute professionalism in her role……. working with our medium term PE plan, providing us with great new ideas and ways to implement the delivery of skills. Her manner with the children is outstanding, ensuring that all needs are met and showing excellent behavior management skills…. Fritwell Primary School Very professional, fantastic behavior management, positive attitude, well planned lessons, children constantly active. Enabled all teachers to create detailed medium term plans to teach from in the future. Linked very well to other areas of the curriculum – French and Maths. Sibford Gower Endowed Primary School ….has always shown great professionalism and has encouraged the pupils to join in all the activities and to understand the importance of carrying out the various multi-skill activities with thought and awareness of muscle memory.